Randy Petalcorin Knocked out the Panamanian boxer Walter Tello to win his first world title belt. 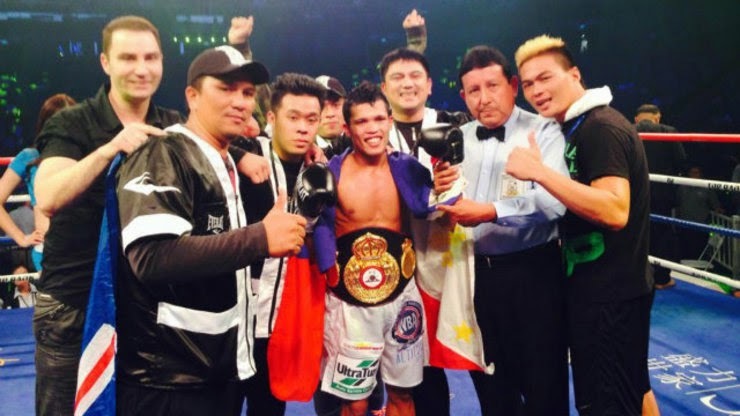 Petalcorin is the new WBA Interim Junior Flyweight champion after he wins via KO in round no.7 last August 26, 2014 at the Mercedes-Benz Arena in Shanghai, China. Petalcorin dominated the fight. He came up with his impressive skills and power to knock out his opponent. In round no. 7 Petalcorin connects with his uppercut that puts Tello into the canvas, Tello rose up but a big hook lands in the face again and the referee Raul Caiz Sr. stops the fight and Filipino from General Santos City wins the match. Petalcorin improved his record with 22W(17KO)-1L while tello drops with 20W(8KO)-8L. The new champion is now looking forward for his next fight maybe against Alberto Rossel of Peru 32W(13KO)-8L.